Does this really work? In an era where our programmatic technology can make multiple decisions in milliseconds, why are we still emailing around lists? Whitelisting and blacklisting was designed for an earlier, simpler (perhaps more naïve) digital era, when achieving brand safety was essential but video campaign performance was secondary. It’s not because we didn’t value performance but because we didn’t have the tools and standards to track and verify performance measures such as video viewability. The last six months, however, have ushered in the viewability era, with an abundance of performance data readily available; now the key question becomes how to best leverage all this performance data to improve ROI. There MUST be a better way to optimize than constantly building and changing our whitelists by hand for each campaign. The digital media world is far too dynamic and data-rich to rely on manually-curated lists. While there might still be a place for domain whitelisting to insure brand safety (and there are vendors such as Trust Metrics who can help with this), it is far too inefficient and ineffective as a methodology for achieving performance optimization. The number of new sites and apps that appear every day pales in comparison to the number of new pages that get created every day, many of which should be in media buyers’ consideration set. No human could possibly identify, rate and filter through this massive and dynamic world of pages, so media buyers simplify the task by using domain-level whitelists. Unfortunately, this one-size-fits-all approach is problematic because it doesn’t scale and leaves too much quality inventory out of the equation. Unlike for display ads, demand for quality video inventory outstrips supply. Whitelisting exacerbates this problem by leaving potential quality video inventory out of consideration because media buyers cannot possibly keep up with the potential universe. This approach fails to recognize that good content and engaged, desirable audiences are everywhere. Why not consider quality below-the-fold placements on top sites if the inventory performs well? Why not consider quality mid-tail or long-tail sites that may be cheaper if they deliver positive ROI? Conversely, why pay premiums for reaching the disengaged audiences on underperforming pages within a top site simply because it’s a well-known publisher brand? In my last article, Viewability: Frack That!, I described how most publishers offer a wide spectrum of ad placements, some good and some bad. In this case, the human requirement to simplify a manual selection process unnecessarily cuts out many good potential placements and wastes precious budget on others. Fortunately, technology is here to help. Computers are fantastic at sifting through large data sets and making complex decisions quickly. We can build up intelligence and apply automation at a much more granular level by looking at individual pages and placements in ways that no human would ever want to tackle. Instead of compiling lists of thousands of placements by hand, we can evaluate millions of placements through machine-learning algorithms, and we can even do A/B testing to vary the logic with a few lines of code. This approach can both open up the universe of potential placements and improve overall performance on existing sites and apps by multiple factors. Whitelist-Schmitelist. 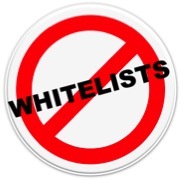 Let’s face it, when it comes to viewability optimization, whitelists should be obsolete. There’s not so much a shortage of good inventory out there, but rather a shortage of good machine learning to mine those hidden gems buried deep inside heaps of ad inventory. So media sellers, quit kowtowing to the whitelist and help media buyers find religion by giving them an alternate technology-driven solution that streamlines their daily workflow and taps into a much larger universe of quality inventory. Here’s a toast in advance to all that time we will have saved by not working off of whitelists…and to our shrunken inboxes!